INCREASE STORAGE SPACE BY 300%. 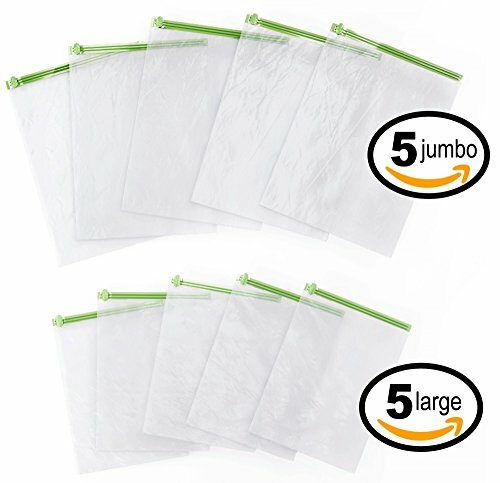 Your purchase includes 5 JUMBO (27.5 x 19.5 inches) plastic space saver bags and 5 LARGE (23 x 15.5 inches) storage bags. 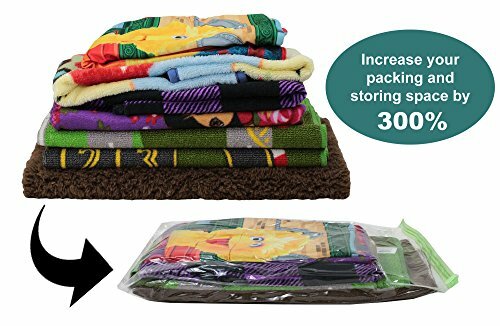 Perfect for condensing shirts, pants, sweaters, jackets, blankets, pillows, towels, and more! No need to struggle with your suitcase zipper or try to cram too much in your backpack. Our roll-up compression bags make packing easier and more efficient, adding extra space and reducing packing frustration for your next trip. NO VACUUM OR PUMP REQUIRED. No need to go through the hassle of using a pump or vacuum to use your compression bags. Valve-suction technology allows for tightly compressed storage and seal without the need for any other equipment. Simply place your items in the bag, zip, and roll! AIR & WATER TIGHT. Not only will our compression bags save you space, they also protect your personal belongings from mold, mildew, dust, and bacteria. 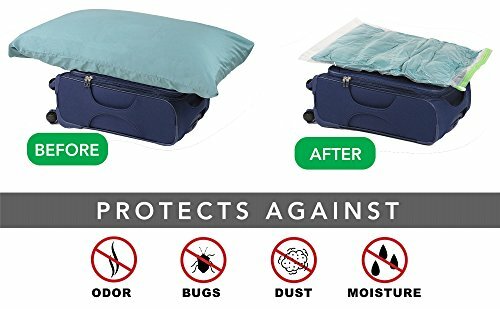 Keep your clothes fresh, clean, and dry while traveling, free from bugs and insects. Packing can be a frustrating chore, especially when there is a lot to pack in a small space. Oftentimes travelers are forced to leave belongings behind due to lack of storage space in their luggage. 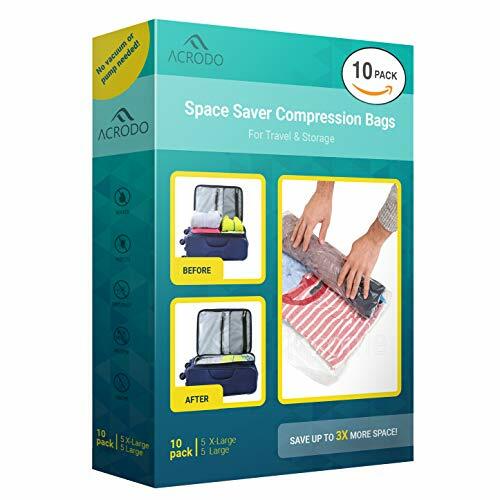 With the Acrodo Roll Up Compression Bags, you can increase your packing capabilities by THREE TIMES. 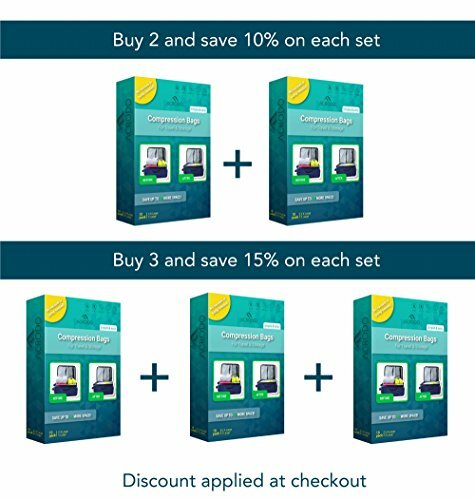 Eliminate your packing hassles and make traveling and storing easier! 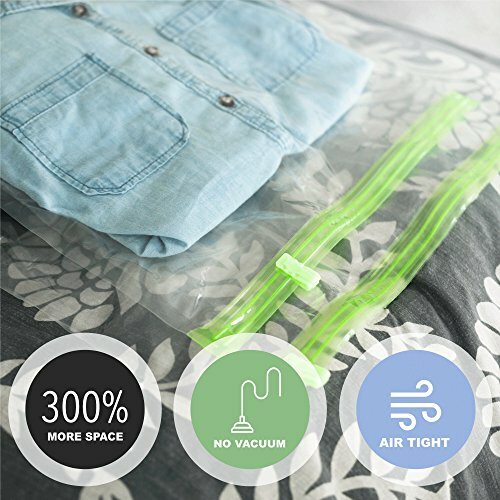 SAVE SPACE CONVENIENTLY with our no-pump, no-vacuum bags. Simply place your belongings in the bag, zip, and roll! 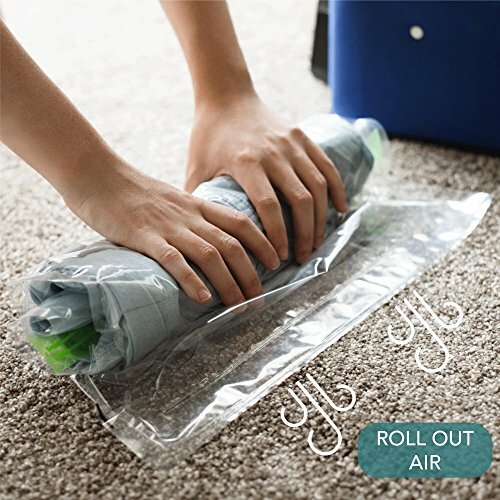 The valve at the end of the bag compresses the air just as efficiently and tightly, without the hassle of a vacuum. EASY TO USE with our step-by-step instructions and How-To Video. You’ll be able to operate your new space-saving bags within seconds. KEEP YOUR ITEMS CLEAN and dry. Our compression bags are air and water tight. Your personal belongings will be safe from dust, mold, mildew, dirt, bugs, and bacteria. Maintain fresh and clean clothes and linens throughout your travels. ORDER NOW RISK FREE. We guarantee 100% satisfaction or your money back. Don’t hesitate to reach out to us with any questions or concerns about your product. We are happy to help! MOST DURABLE PLASTIC. At 70 micron plastic thickness, we offer the best available for space saving bags. Increased durability, longevity, and protection are all features you will enjoy with Acrodo Compression Bags. 100% SATISFACTION GUARANTEE – RISK FREE. Buy today risk free. Your satisfaction is our priority. If for any reason you are not happy with your purchase, we will be happy to assist you and do whatever it takes to make it right.